Marilyn SanClemente February 5, 2018 February 5, 2018 All Occasion Card, Birthday, handmade card, Handmade cards, Occasions catalog, Stampin' Up! Today I am sharing another card made with the Painted with Love Designer paper from Stampin’ Up! that was designed by my very talented downline friend Margaret. The difference is that this card is a Birthday Card and not a Valentines Card. Another great way to use this paper. It is not for just Valentines! So here are the details on this card! the Card base is a piece of Whisper White Cardstock cut to 8 1/2″ x 5 1/2″ scored at 4 1/4″. Next is a layer of Powder Pink cardstock (one of the in colors) cut to 5 1/4″ x 4″. Next is a layer of Rich Razzleberry cardstock which is cut to 3 5/8″ x 4 7/8″. Next are 4 pieces of the Painted with Love Designer Paper cut to 1 3/4″ x 2 3/8″ layered onto the 3 5/8″ x 4 7/8″ piece of Rich Razzleberry cardstock and layered onto the powder pink layer. There is a strip of the gold vinyl painted love stickers along the bottom of the cardstock. The centerpiece of this beautiful card is the birthday greeting. The greeting is stamped with Rich Razzleberry ink on a piece of whisper white cardstock using the Picture Perfect stamp set. 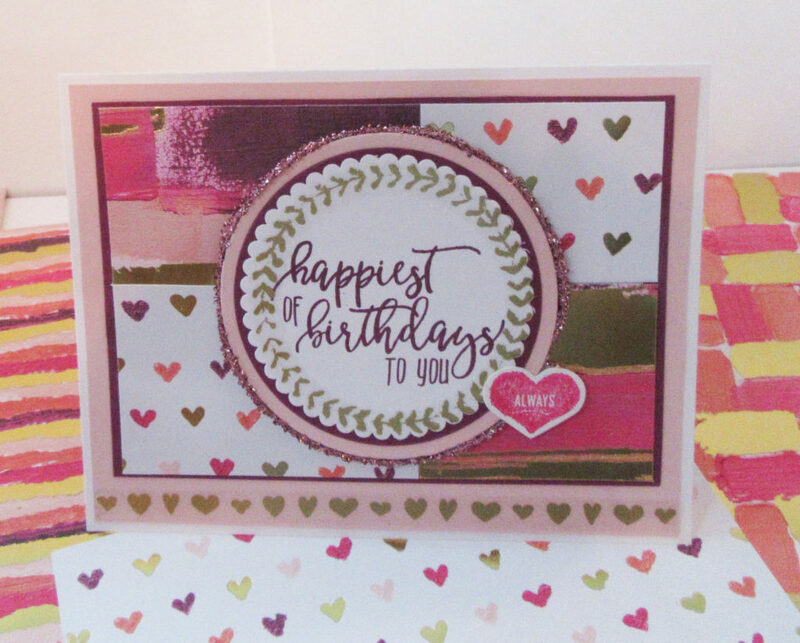 There is a round painted with Love vinyl sticker around the birthday sentiment. This piece has been cut using a scalloped circle from the Layering circle framelits set. This is layered onto a slightly larger circle cut from a piece of Rich Razzleberry cardstock. And then this is layered onto a third larger circle cut from powder pink cardstock. Around the edge of this focal point is wrapped a piece of the Pink tinsel trim that coordinates with the Painted with Love Designer paper. The centerpiece is then layered onto the front of the card. Stamp and cut out a small heart from the Sure Do Love you stamp set. Place on the side of the centerpiece. Here are the products that were used for this card!